This colourful play tent with pictures of fairies is bound to become a popular hideaway and place to play. There is plenty of space to play in this cute tent as its dimensions are 112 x 112x 94cm. It can also be used as a practical place to store toys. It is made of strong, durable material, and its lightweight construction makes it easy to put away or take with you. This toy complies with Directive 2009/48/EC of the European Parliament and of the Council on the Safety of Toys, dated 18 June 2009. There is also a CE declaration of conformity. 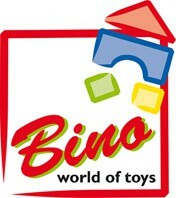 For shipping to other EU countries visit this page Bino Fairy Tent. Für Versand nach Deutschland, besuchen Sie bitte Bino Spielzelt - Fee. Chcete doručit zboží do Česka? Prohlédněte si Bino Dětský stan - Víla. Chcete doručiť tovar na Slovensko? Prezrite si Bino Detský Stan – Víla. Für Versand nach Österreich, besuchen Sie bitte Bino Spielzelt - Fee. Magyarországra történő kiszállításért tekintse meg ezt a termékoldalt: Bino Gyermek sátor - Tündér.